Our stay at your facility was an unexpected pleasure. Your location was perfect and we enjoyed the suite. Being a frequent traveler, I will strongly consider staying with you again the next time I am in New Orleans! "We really did enjoy our stay. The personnel were helpful, pleasant to deal with. Good luck with the work redoing the floors. That will be a big boon to your hotel. We also appreciated the value attached to the on-line certificate package. Thanks so much for taking good care of us." "We both enjoyed our stay at the Warwick Hotel- New Orleans... We were grateful for your hospitality and your wonderful customer service. The ladies at the front desk were very pleasant and helpful, and housekeeping seemed to be keeping the hotel in tip top shape. The free parking was also another wonderful part of the stay. I am so happy to see that you are thriving and surviving after the major crisis. I can only hope for and expect great things and prosperity for your business. We do wish you the best, now and always. We will certainly visit again in the future. 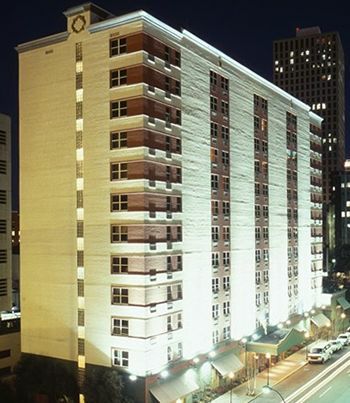 Nestled in the heart of Downtown New Orleans known as The Central Business District, Warwick Hotel New Orleans is within walking distance from where you want to be. Only blocks from places like the Louisiana Superdome, Medical Center, French Quarter, Aquarium, Riverwalk, Morial Convention Center, Harrah’s Casino and many other popular places. We are located close to everything that New Orleans has to offer. "My stay was great and I thank you for the coupons and card that was left for me at the front desk. Unfortunately, I was unable to use the coupons due to time constraints. The room was exceptionally nice, and I appreciate you responding to my request to be placed on the highest floor possible. I wasn't expecting a suite, but it was appreciated. The only bad experience was tropical storm Cindy and I believe that just added to a good night's sleep. I think it would be safe to say, that should I return to New Orleans on future business, you will be receiving my business once again. Thank you and your staff for a wonderful stay... Hope you were able to keep dry while Dennis was passing close by..."